Christmas eve fell on a Friday this year, and even though we are not overtly religious, we (my husband and I) are both from families who are, and grew up eating fish on Fridays. We still do it for the most part, but mostly out of habit. I have been having the strangest craving for English style fish & chips, but the only place around here that makes them fairly decent is an Irish style pub, but unlike the UK English pubs, this one is not quite so kid friendly. So I decided to try making it myself using a beer batter recipe that I have been meaning to try for a while now. 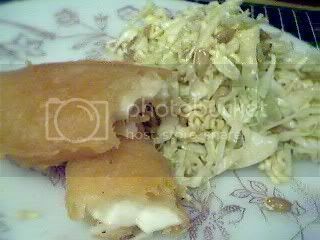 I just couldn’t get myself to fry “chips” with it though, so we had a slaw like cabbage salad with it instead. The fried fish came out delicious! Crunchy batter and very moist, not dried out fish inside. Mix all the batter ingredients together and refrigerate for 15 minutes – 1 hour. In the meantime, heat your oil to 350-degrees F and dredge the fish strips in cornstarch. When the oil is ready, dip the fish strips in the batter mixture and fry in the hot oil until golden brown. I hope you try this one, it’s awfully sinful, but OK once in a while. I used Canola Oil to fry. And I just commented on Celias site that I’m collecting a bunch of recipes to try for the New Year. Wow!! You changed the look of your blog! Very nice! You know, I love it when I can take a break from blogging and hop on over to my favorites just to see what’s cooking in the kitchen. Fish and chips? Hmm….sounds like I have to try this one, because I’ve never made a beer batter! And that is good that you use Heineken beer because that is my favorite!